Millennium Specialty Coco Products Inc. 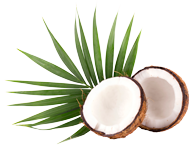 The coconut products we produce include desiccated coconut meat, virgin coconut oil, coconut flour, coconut milk, coconut water, and coconut water concentrate. MSCPI is backed by the Ching Bee Group of companies. Established over 50 years ago, the Ching Bee group of companies has proven to be the Philippines' pioneer in producing and exporting coconut products and many other raw materials. Third Millennium Oil Mills Inc.